This finely ground, translucent face powder enables you to achieve a professional finish to your make-up application. The refined textured powder controls shine and helps prevent oil breakthrough whilst adding a hint of color for a smooth, natural looking complexion. Gives a much sheerer finish than pressed powders as it contains very little pigment. Ideal for blending blush and foundation colors together, and correcting over-blushing or over-bronzing. • Finely milled, velvety soft formula smooths the skin's texture without appearing 'cakey' or overdone. • Eliminates shine and prevents oil breakthrough for a fresh, professional finish. • Your makeup will last much longer! 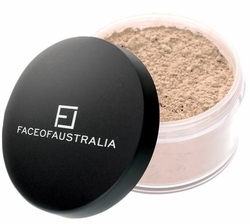 • Can be used to set foundation or worn with primer as a base to enhance natural complexion. STEP 1: Apply after applying foundation or primer. STEP 2: Using a cosmetic puff or round powder brush, apply the powder lightly and evenly all over your face. STEP 3: Brush away excess powder.